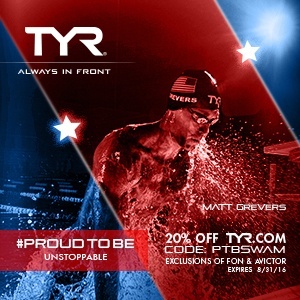 Available race videos courtesy of Team USA, NBC Sports and SwimStrength. As originally reported by Mitch Bowmile. Sixteen years after winning gold at the 2000 Olympic Games, Anthony Ervin will be back competing in the 50m freestyle at his third Olympics. It came down to the wire, but ultimately it was American record holder Nathan Adrian who got his hand on the wall first with a 21.51 in order to secure his second individual event for Rio. Ervin was right behind him by the smallest of margins, finishing second in 21.52. 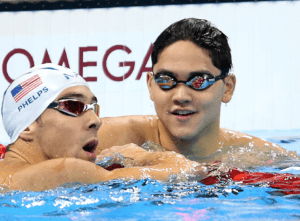 It was an absolute dog fight in the men’s 100m freestyle to say the least, and reigning Olympic gold medallist Nathan Adrian managed to come out on top. With the second fastest time in the world this year, Adrian held off both Caeleb Dressel and Ryan Held in order to grab the win with a 47.72. Dressel was second in 48.23, securing an individual swim in Rio by just three one-hundredths of a second as Held touched third in 48.26. Anthony Ervin touched fourth in 48.54, securing his spot on the Olympic team as a relay swimmer. He went out fast, turning in first, but ultimately couldn’t hold on. Jimmy Feigen was fifth, Blake Pieroni was sixth. For the second time this week, Ryan Lochte failed to qualify for an individual event for the 2016 Rio Olympic Games. After 50 meters Lochte was out with the leaders; Townley Haas and Conor Dwyer. A huge first turn put him in front of them as they charged to the halfway point. Dwyer turned first in 51.09, Lochte was right behind him in 51.40. With 100 meters to go, Townley Haas began to creep up on Dwyer and Lochte. 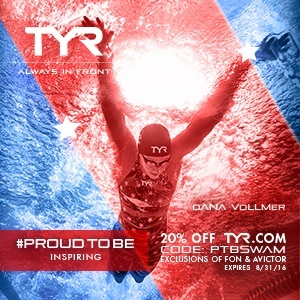 At the 150 meter mark it was Dwyer-Haas-Lochte. A huge last turn once again put Lochte in the hunt for the win, but Dwyer and Haas chased him down. Texas’ Jack Conger began to rev his engines and catch up to the front pack. Heading into the wall it was all too close to call. Twenty meters to go and Lochte began to fade. Haas passed him, and Conger passed him as they all raced towards the wall chasing down Dwyer. Ten meters to go, and Haas began to really charge on Dwyer. As they all stretched into the wall Haas got the magic touch with a 1:45.66 to Dwyer’s 1:45.67 to punch in his ticket to Rio. Jack Conger ran out of pool and couldn’t take down the two leaders, ultimately finishing third with a 1:45.77. Lochte touched fourth in 1:46.62, short of an individual roster spot, but good enough to be a lock for America’s 4x200m freestyle relay. Gunnar Bentz touched in for fifth, Clark Smith finished right behind him. 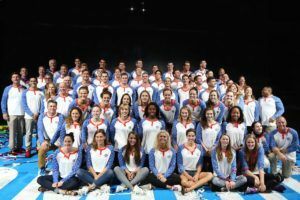 Both swimmers are going to have to wait to see if they’re added to the Rio roster for the relay. Tyler Clary finished seventh, outside of a relay position, and has yet to make the team. Clark Smith was out like a rocket right from the get-go in this race with only one plan in mind: to hold on. Up until the 300-meter mark he looked amazing, ahead of world record pace and fighting to keep his position as they approached the wall. Dwyer made his move and turned first at the 300 with Smith holding on to second and Connor Jaeger advancing to third. Top seed from prelims Zane Grothe turned in fifth behind Townley Haas as they all turned on the jets for the last 100. At 350 it was Dwyer-Jaeger with Smith fading to third. With a 28.05 last 50, Jaeger pulled out ahead of Dwyer to clock in at 3:43.79 ahead of Dwyer’s 3:44.66. Haas improved his placing to touch in for third in 3:45.04 with Grothe behind him in 3:45.60. Clark Smith faded hard on the final 50 and was forced to settle for fifth in 3:45.74. American record holder Connor Jaeger won the 1500m freestyle to close out the trials in speedy fashion, fighting to the wall with Jordan Wilimovsky as the two secured another event for Rio. The two were way out in front chasing down Peter Vanderkaay’s U.S Open record of 14:45.54, but ultimately fell short as Jaeger won in 14:47.61 and Wilimovsky was second in 14:49.19. With that second place finish, Wilimovsky became the first American to qualify for the Olympic team in both open water and the pool. The 100m butterfly has always been that one race that Michael Phelps gives everyone a heart attack. He leaves it until the last minute to come home with the win, and why would the last time he raced on U.S soil be any different? 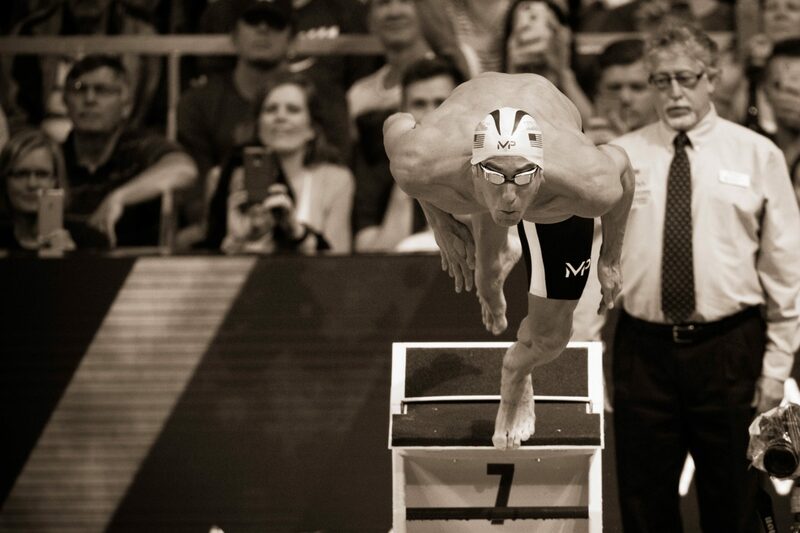 Phelps was out in fourth with a 26.06, but on that final 50 he came home strong. 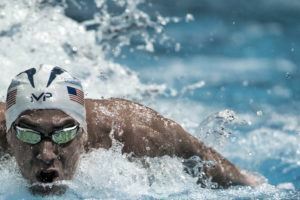 It wasn’t until the last 20-meters that Phelps really began to edge out to the front of the field in order to establish himself as the leader. At the touch, he clocked in a 51.00. He smacked the water. He spit water out of his mouth. And then he climbed out of the water at these trials for the last time after a race. Right behind Phelps was Tom Shields who rocked a 51.20 to secure his second swim at these Olympic Games. Phelps and Shields will both be competing in the 100 and 200m butterflies in Rio. Seth Stubblefield of Cal and Jack Conger of Texas just missed the Olympic team. Stubblefield was a 51.24, 0.04 seconds behind Shields, and Conger was a 51.26, 0.06 seconds behind Shields. 2012 Olympian Tim Phillips was third in 51.44. Michael Phelps will be heading to his fifth Olympic Games after a first place finish in the 200m butterfly. At the first 50, Phelps was just 0.19 seconds ahead of world record pace. At the 100-meter mark, Phelps was once again just 0.19 seconds ahead of his world record pace. At the 150, Phelps fell off his pace but was still in the lead, holding off all advances from Tom Shields. In the last 20-meters Phelps began to tighten up, but still managed to get his hands on the wall first for a winning time of 1:54.84. Shields also tightened up towards the end but managed to hold on for second with a 1:55.81 ahead of Jack Conger‘s 1:56.45. Gunnar Bentz was fourth in 1:56.46, Chase Kalisz was fifth in 1:56.64. With all the buzz around the pool deck centered around the men’s 100m backstroke and the possibility of a world record, stakes were high. David Plummer‘s been amazing this year, Ryan Murphy has been amazing this year, Matt Grevers is the reigning Olympic champion. Flying across the pool on the first 50 with the fastest turnover in the entire field, Plummer took the lead turning under world record pace. Right with him was Murphy who also turned under world record pace as the two churned for home. Plummer and Murphy began to distance themselves in the final stretch from Grevers as Jacob Pebley began to creep up. Murphy got his hand on the wall first securing his spot on the Olympic roster in 52.26 with Plummer second just two one-hundredths behind him in 52.28. Grevers finished third in 52.76 with Jacob Pebley also dipping under 53-seconds in 52.95. Just like Lilly King in the breaststroke, Cal’s Ryan Murphy took the sweep in the men’s backstroke events with a 1:53.95 performance that put him in first ahead of his teammate Jacob Pebley and reigning Olympic champion Tyler Clary. Pebley was out first in 27.04 followed closely by both Ryan Murphy and Sean Lehane. At the halfway mark Murphy had overtaken the lead, turning first in 55.46 with Pebley on his heals and Clary not far behind him. At the 150 Murphy still had the lead as they continued in the same order with 50-meters to go. Down the stretch, Clary made a charge, but ultimately couldn’t pass Pebley. Murphy got his hand on the wall first in 1:53.95, Pebley was second in 1:54.77, Clary was third in 1:55.33. That was Clary’s last chance to make the Olympic team, he will not be going to the 2016 Rio Olympic Games. 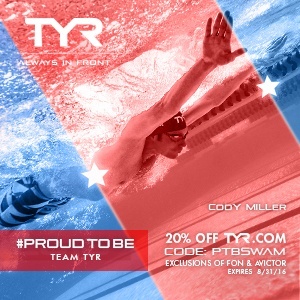 As expected based on their impressive prelim and semifinal swims, both Kevin Cordes and Cody Miller touched the wall ahead of the rest of the field in order to secure their spot on the American Olympic team. Out first at the wall, Cordes turned in 27.49 with Andrew Wilson, Marcus Titus, and Cody Miller hot on his heels. As he advanced forward to the 75, he began to separate himself from them as did Miller. With 10 meters to go, Miller creeped right up on Cordes’ shoulder, but didn’t have enough to overtake him as Cordes clocked in at 59.18 to Miller’s 59.26. Josh Prenot passed both Wilson and Titus in order to claim the third spot. Michael Andrew was fourth in a new national age group record time of 59.81. Move over Kevin Cordes, Josh Prenot is the new American record holder in the 200m breaststroke and the second fastest performer of all time in this event. Prenot swam the most controlled 200m breaststroke of the field, waiting patiently until the last 50 to fully strike and take down both Cordes and Texas’ Will Licon. After the first 50, it was Cordes ahead of the field with a 28.49 split, turning in under world record pace. Prenot turned fourth in 29.21 behind Cordes, Cody Miller and BJ Johnson. At the 100-meter mark Cordes turned in a 1:00.77, well under world record pace and almost a full second faster than Prenot who turned in 1:01.47. Once again, he was fourth to the wall, this time behind Will Licon and Miller. On the last wall Cordes was ahead and still well under world record pace with just 50-meters to go. Prenot moved up to second at the 150, passing both Licon and Miller in order to make his move. Prenot began to fly, splitting a 32.98 on the last 50 (almost a full second faster than anyone else in the field), and heading hard into the wall. He passed Cordes with roughly 30-meters to go and charged to the wall, chasing the world record. Cordes and Licon began to battle for the silver, trading the second place position back-and-forth. Prenot touched in for gold in 2:07.17 to put up the second fastest performance only behind world record holder Akhiro Yamaguchi. Cordes managed to get has hands on the wall ahead of Licon with a 2:08.00 to Licon’s 2:08.14. Michael Phelps and Ryan Lochte went head-to-head for the last time ever on U.S soil, and the results came up in favor of Phelps. Phelps took things out in first following the fly leg, turning in 25.05. Andrew Seliskar turned second ahead of Lochte who turned just behind in 25.19. At the 100-meter mark, Phelps and Lochte had established themselves as the leaders although Phelps’ teammateDavid Nolan was right in the mix. At the 150, it was Phelps and Lochte way in front with just 50-meters to go. A big turn for Lochte put him at par with Phelps, but in the final stretch Phelps made sure to edge out in front and take the win in 1:55.91. Lochte was second in 1:56.22. Nolan touched in for third in 1:59.09. Dethroned. For the first time since the 2000 Olympic Games, the 400m IM will not feature Ryan Lochte or Michael Phelps. 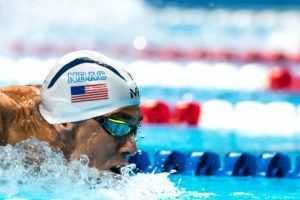 Chase Kalisz claimed the 400m IM crown with a wicked breaststroke leg to push past 2012 Olympic champion Ryan Lochte before holding on for the freestyle and touching in to be the first swimmer on the U.S Olympic team. It was all Lochte after the fly, leading with a 55.39 split. After the backstroke leg Lochte had opened up his lead significantly. Kalisz pushed past him on the breaststroke leg, and to everybody in the crowd it appeared that the race was between Lochte and Kalisz. Kalisz turned in 3:10.07, Lochte turned in 3:11.46, and nobody paid attention to a charging Jay Litherland who turned over two seconds behind Lochte in 3:13.64. Fifty-meters of freestyle to go and Kalisz was still in the lead, Lochte was still in second. 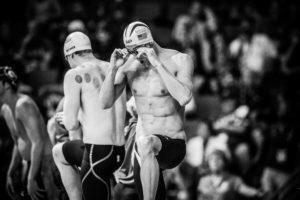 With all eyes still on those two, Litherland’s 28.82 freestyle split went largely unnoticed. 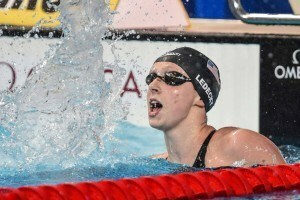 Coming home Lochte began to fade, Litherland began to accelerate, and with 25-meters to go Litherland passed Lochte. Kalisz touched in 4:09.54, Litherland touched in at 4:11.02 to deny multi-time Olympic medallist Lochte a spot on the 2016 Olympic team. Lochte was third in 4:12.02. Gunnar Bentz finished fourth in 4:13.72 making him the third Georgia swimmer in the top four. I would love to purchase a DVD of the trials. Is there one for sale?